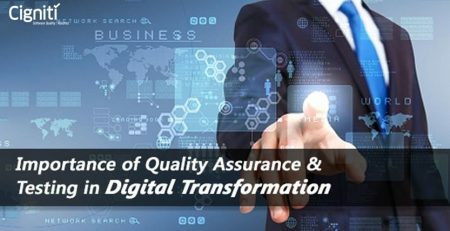 How can Software Quality Assurance Impact Digitization of The Aviation Industry? 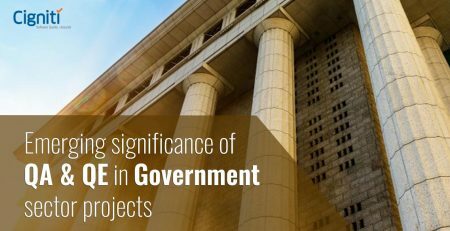 In a general sense, digitization translates into automation of processes and business models by leveraging digital technologies, data sources, and people. How do you perceive the implications of digitization for the Aviation industry? It can be viewed in the way the airlines redesign and modernize their existing range of products and service by embedding digital functions and incorporating add-on digital solutions within the current portfolio. However, Digitization can be chaotic if the digitally powered products and services are not quality-proofed. Moreover, the Aviation Industry need not necessarily reinvent digitization, it can just leverage the existing partner ecosystem and their innovative efforts within their services and propositions. Even if you consider this strategy, what are the chances that what works for other industry with work for the aviation industry as well. This kind of validation can only come with rigorous testing and assurance from the software testing strategy. Ensuring that your application or an overall integrated system works seamlessly is absolutely critical for every industry, and very much for the Aviation industry, as it continues to face some burgeoning challenges. Why is Digitization critical for Aviation? Every consumer holds a mobile and accesses a diverse range of applications for availing various services. It is absolutely critical for the aviation sector to pitch itself in this digital ecosystem. Online tracking, online bookings, online discounts, and much more needs to get lined up for ready consumption by the customers. Digitization means competing for the market space and the share of customers. Additionally, ensuring that the service and the application extended brings relevance for the consumers and serves what is needed. For instance, if online tracking of flight timings and delays is the need, consumers might not be interested in knowing much about services such as in-flight entertainment or shopping experience. Airlines can even upsell services by leveraging digital technologies and tapping unexplored consumer segments. This will enable them to bring in profits and ensure profitability on a consistent basis. Moreover, it will add to the consumer experience and satisfaction levels, which will be another boon for the airlines. Enhancing efficiency on a consistent basis is absolutely critical for any industry. Likewise, for the aviation sector, digitization is a way to bring in efficiency with Data Analytics. Big Data and Analytics plays a major role in providing the needed insights and revelations for the aviation sector. With various data insights airlines can effectively target various sets of consumers and bring in meaning for their business and marketing strategies. Segmentation of services as per the target groups is the greatest boon that digitization can bring for any industry. This will reduce unwanted efforts and cut down the overhead costs, ensuring cost optimization. Any service posted across an application or a digital platform needs to get tested for Performance, Functionality, Security, and round-the-clock availability. If any one of these factors falter, it can result in a chaos and reputation loss as well. System outage, cyberattack, or data breach; anything and everything can impact the smooth functioning of the airline or the airport system. There are news reports emerging about system outage at airports and even with the airlines. This has resulted in international and nation-wide delays and led to wrath from the flyers. It has definitely given bad name for the industry as well as the airlines. Considering that it is a highly competing industry, there are bright chances of flyers choosing another competitor over the one who keeps on causing issues with their services. Instances such as these keep happening, which has resulted in major reputation loss for airlines and airport authorities as well. Even when it comes to data analysis and deriving relevant data points, quality assurance is needed to effectively implement the pattern and the code to get relevant insights. Only when all the strings work flawlessly, it can provide the expected outcome. With airline applications, there is a growing need to keep them upgraded and up-to-date with compelling interface and support it with the required on-ground services. This will help airlines to retain their customers and even upsell their services via various platforms. Aviation industry is responsible for not just providing travel facilities, it is an overall experience that begins right when the customer chooses to go online and book a ticket. Digitization empowers airlines and airports to deliver a holistic experience, which is impossible without robust quality software that runs various applications. 95% increase in testing operational efficiency and improved reliability of the internal system for a Middle Eastern Airline. 30% increase in the test coverage for one of the world’s leading airline based out of the UK. 55% increase in overall performance of the key flows and an increase of revenue by 8% for a Malaysian low-cost airline. 45% increase in passenger traffic due to improved usability of the mobile app for an Irish low-cost airline. Connect with our experts to know more about Cigniti’s Centers of Excellence that are ably supported by in-house Labs and SMART Tools for providing end-to-end testing services. 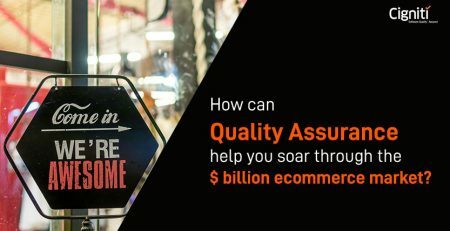 How can Quality Assurance help you soar through the $ billion ecommerce market?